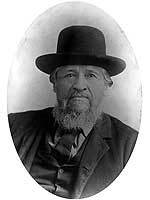 Born at St. Francois Xavier on 17 March 1837, son of Pascal Breland and Maria Grant, grandson of Cuthbert Grant, he worked as a fur trader, traveling between Manitoba and the Cypress Hills, as well as other points in the North West Territories with as many as twelve ox-driven carts. In September 1863, he married Helene Dease (1844-?) of the US. They had seven children: Tobie Breland (1866-? ), Alexandre Breland (1872-? ), Alfred Breland (1875-? ), Dolphis Breland (1877-? ), Edmond Breland (1883-? ), Josephine Breland (1885-? ), and Virginia Breland (?-?). He served as a Justice of the Peace in the North West Territories and as Reeve of the Rural Municipality of St. Francois Xavier from 1891 to 1892, and from 1895 to 1900. Acclaimed in the 1879 provincial general election, he served until 1883. He died at St. Francois Xavier on 3 April 1908. Canadian Parliamentary Guide, 1881. Manitoba Legislative Library. Our First Hundred Years: A History of St. Francois-Xavier Municipality. St. Francois-Xavier Municipality Historical Committee, 1980. Manitoba Legislative Library, F5648.S234, page 147.